Strange happenings in the digital world. Our University is hosting Westcast, a teacher education conference, this year. 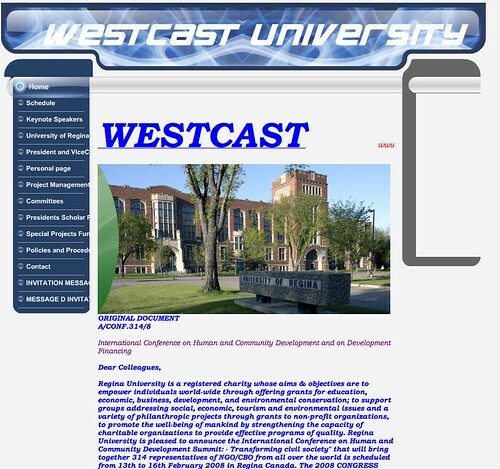 However, someone has setup a fraudulent website titled “Westcast University” with direct pieces from our conference website and our University website. This looks like an academic-based 419 scheme. After a few emails to the company hosting the site, it was taken down. I have sitesucked the entire site to use in future presentations. If you would like a copy, let me know. Here are a few quotes from the fraudulent site. Remember, the real Westcast conference is a Canadian conference focused on Teacher Education. Regina University is a registered charity whose aims & objectives are to empower individuals world-wide through offering grants for education, economic, business, development, and environmental conservation; to support groups addressing social, economic, tourism and environmental issues and a variety of philanthropic projects through grants to non-profit organizations, to promote the well-being of mankind by strengthening the capacity of charitable organizations to provide effective programs of quality. Regina University is pleased to announce the International Conference on Human and Community Development Summit: – Transforming civil society” that will bring together 314 representatives of NGO/CBO from all over the world is scheduled from 13th to 16th February 2008 in Regina Canada. Wow, sounds like a great international conference. But, this is not our conference. And we are not “Regina University”, rather, the University of Regina. Apart from the financing of the 8 richest countries of the world (G8), the summit receives financial support from the Mitsubishi Bank of Japan and the Every Johnson Foundation for the participation of civil society members. As a result, Regina University will provide sponsorship for up to (03 – 05) international delegates from selected organization School and Association. Wow … what a deal! How generous! So, what do I need to do to sign up? Oh, looks like there is a registration process. It looks pretty simple, but don’t forget, there is just a small registration fee. Payment Slip of the Registration Fee: The required registration fee of USD 210 $ per selected applicant should be paid through our nearest Legal Representation in your continent through Western Union Money Transfer. And just to make things really easy, “Regina University” lists a representative in many geographic regions including Asia, Europe, Africa and Australia. As mentioned before, this could be considered an example of a “419 scheme“, also known as “advance fee fraud“. These schemes typically aim to persuade people to “advance relatively small sums of money in the hope of realizing a much larger gain.” I know that usually 419 schemes promise much more than simple conference travel and accommodation (usually millions of dollars), but I am not sure how else to categorize this other than simple fraud. Thoughts or comments on this issue? Has anyone else heard of an example like this? I have found many good stories via Digg since the site has been around. Now, I understand that the Internet is not the most wholesome of places, but I am increasingly repulsed by the bad-taste of Digg commenters. It seems to be getting worse and worse. so i’m feeling that deep & instant empathy i always feel for other parents who’ve lost a baby — but that’s not the worst thing. that first comment, and the +83 diggs it’s gotten? that’s … hideous. in spite of the revulsion i feel at the individuals who contributed to that number, i sincerely hope that they never have to experience the loss of a little one — no matter how badly they need some perspective on the subject. here’s hoping they find that perspective some other way. meanwhile, i seriously need to turn off my digg feed and go take a shower. ick. just ick. I’ve killed my Digg feed permanently. I do enjoy many of the stories that come through, but we really need an eduDigg of sorts, something with similar contributory mechanisms, but utilized by those with souls. Here’s MyDeathSpace … sad and eerie if this is real. Basically, at first glance, it appears to be an archived list of people with MySpace accounts who have passed away. It’s certainly sad to see so many young lives lost. I assume most of my readers have followed the One Red Paper Clip site. If not, do check it out. I just noticed (via Digg) that a new offer on the site seems to come from the Mayor of Kipling Saskatchewan, a community very close to where I live. Thatâ€™s the offer! We are confident you will say YES! Now we want to let you know why we are making this offer to you. This is some bizarre investigative reporting from Cleveland. I was recently informed by my friend Peter Rock, a teacher in a West African school, that his attempts to bring open source software/philosophy into his school context have been abruptly blocked by his administration. Peter writes eloquently about his experience and gives the grim details. It’s a bit of a horrifying read as what seemed like progress shifted rapidly to a wide-scale ban of free/open source software. Check out the entire post here, and give Peter your support. He’s a a really tough crusader against some really incredible resistance. This may be one of the most graphic examples I have seen of FUD as it applies to school technology policy. Update: Miguel Guhlin writes a very thoughtful response to Peter’s situation. It’s definitely worth a read. I remember reading a while back about Mosquito, a “youth deterrent system” which is described as a speaker system that emits high-frequency tones that are only heard by teens. t works by broadcasting unpleasing sounds at a frequency that can be heard by younger people only. It has an effective range of about 20 meters. Now, supposedly, some teens have recorded the frequency and produced it as a ringtone. Well now techno-savvy pupils have recorded the ultra-high sound – audible only to under-20s- onto their cell phones, and are now receiving calls and text messages in class – without teachers having the faintest idea of what is going on. This sounds pretty far-fetched but is based on a real condition called Presbycusis, loss of hearing that occurs in individuals as they grow older. Interesting stuff! Coinciding with the Gore-led climate change movie, An Inconvenient Truth, to be released, corporate propagandists are releasing 2, 60-second television commercials focused on “the alleged global warming crisis”. So the Gore movie will at least give lots of good and appropriate work to bloggers, as lots try to spin the story told by Gore. My favorite so far are two ads released by the Competitive Enterprise Institute. (Both are here.) The first is totally empty and hilarious, with the slogan (and who could make this up): CO2: They call it pollution. We call it life. CEI: They call it truth. Scientists call it lies. I discovered this interesting sign promoting a local Regina restaurant. While I have nothing against the restaurant (in fact it’s rather good), I guess in the technology world, this might be similar to believing a Microsoft Total Cost of Ownership report. Yea, more than slightly biased. For a second, I thought I was reading The Onion, until I realized, this may very well be true. It seems that Kari Smith, an American, recently sold her forehead as an “advertising billboard” to the Golden Palace Casino. The words “GoldenPalace.com” have been tatooed on her forehead as a promotion for the Ontario-based casino. The transaction was made through an eBay for a reported sum of $10,000. Smith is quoted as saying, “I really want to do this … To everyone else, it seems like a stupid thing to do. To me, $10,000 is like $1 million. I only live once, and I’m doing it for my son. See the full story at here. Also, here’s an interesting precursor to this story from back in March by CBS News. Hmmmm … did I coin that term? If I did, I’d rather not take credit for it. I think you can finally declare that a technology has made it when the pornographers begin to exploit it. In this particular case, it’s happened to podcasting. I guess we should have seen this coming. This last semester, I’ve mentioned happy slapping a fair bit, along with other abberant, digitally-inspired behaviours. If you haven’t heard of happy slapping, well it’s a phenomenon sweeping the UK in which an individual slaps or strikes a (usually) complete stranger while the incident is recorded on a video-enabled mobile phone. Of course, since such phones are also Bluetooth or MMS equipped, videos can be usually traded, shared and uploaded, and competition promotes one-upness. A recent article by Carl Longino (via Boing Boing) helps to support the point that these incidents should be taken seriously, and instigators are violent criminals. Longino points to a video compilation by blogger Alfie Dennen which shows just how violent these attacks can in fact be. If you are at all sensitive to violent video footage, skip it. However, if you want to see how bad this problem could get, you may want to take a look. Scary stuff.